I think the draw is the beauty of the language, the stateliness of the blank verse, and especially the topic: heroism. Throughout my life I have had difficulty sleeping from time to time. When I was little I amused myself in the dark hours by retelling myself the stories Cinderella and Sleeping Beauty, usually making these princesses ride around with their swords saving beleaguered princes. 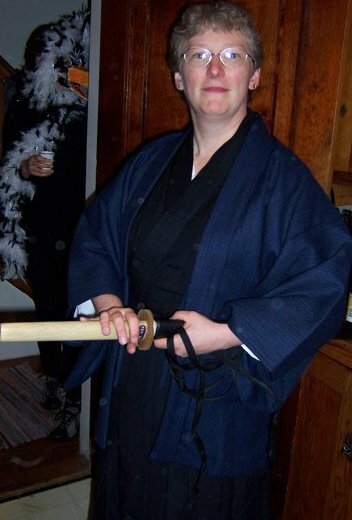 In Japan I studied kendo, and back in the states I have studied iaido, and also forms for the Chinese jian, straight sword, and dao, broadsword. I have not found a beleaguered prince to save, but I keep looking, because you never know, and at the very least my studies have given me great Halloween costumes. Then there are times when I end up binge-watching Xena: Warrior Princess. This show, known as much for its camp style as its very stylized Hong Kong cinema martial arts, is a joy to watch. I like that while Xena sticks to her sword and chakram, her sidekick Gabrielle uses a staff for the first five seasons and sai for the last season. (Yes, I have studied the staff. The sai, not so much but I have a pair to use for wrist strengthening exercises. Us martial artists, we loves us our toys!) I like the partnership between the two main characters, which becomes more and more equal as the show goes on.